A DECORATIVE WAY TO KEEP YOUR HOUSE CLEAN: No more messy floors! 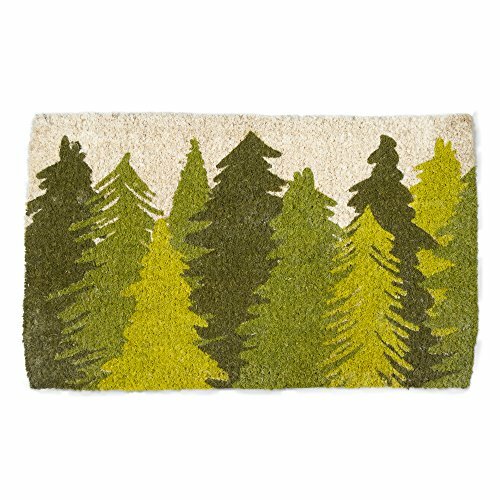 TAG's Coir Doormats are a decorative way to keep dirt and moisture out of your home. Available in a vast variety of colors and patterns, these doormats are sure to brighten up your front porch, patio or entryway. DURABLE 100% NATURAL COIR CONSTRUCTION: Coir is a natural, renewable material extracted from coconuts that is extremely durable and easy to maintain. The 100% natural Coir material serves as a boot scrape and effectively captures moisture, dirt, and other particles. HIGH-GRADE COLOR PROCESS RESISTS FADING: TAG's Coir Doormats are printed with pigment dyes in a high-grade color process that is fade resistant. In addition, the Coir fibers are peroxide bleached to make the designs pop. These doormats remove dirt from shoes while staying bright and colorful season after season. EASY TO MAINTAIN AND CLEAN: The best way to ensure the longevity of the doormat is to place it in a sheltered area away from direct sunlight and excessive moisture. Simply brush or shake the mat to clean and maintain its appearance. ABOUT TAG: Since 1975, tag has been designing and manufacturing gifts and decorative accessories for the home. Our vision is to bring well-designed, stylish and affordable products into the home of every consumer. Our collections include an array of everyday products that sell 12 months of the year as well as a mix of seasonal products that support festive holidays and all four seasons.